In the pre-credits sequence, after a 6-month space flight from Cape Kennedy, astronaut Taylor (Charlton Heston) completed his final log report as a fully-automated touchdown sequence was initiated. The other three astronauts, Landon (Robert Gunner), blonde female Stewart (uncredited Dianne Stanley), and Dodge (Jeff Burton) were in deep sleep hibernation. According to Dr. Haslein's time theory, their ship time was July 14, 1972, but Earth's time was March 24, 2673 - due to their vessel traveling at the speed of light. Earth had aged almost 700 years since they had left, but they hadn't aged hardly at all. Taylor mused about how he had left Earth in early 1972 because he hated humanity: "I leave the 20th century with no regrets," and then added: "Seen from out here, everything seems different. Time bends, space is boundless. It squashes a man's ego. I feel lonely." He wondered if humans on Earth were still engaged in warfare, or enabling starvation of their neighbor's children. Taylor joined his fellow crew members in deep sleep. After the credits, the spacecraft crash-landed in a large lake amidst towering, desolate sandstone rock formations [filmed at Lake Powell on the Utah-Arizona border]. The three bearded male astronauts awakened in their hibernation bunks - and discovered that Stewart had perished due to a crack in her individual capsule that caused an air leak. The hatch began to leak water as the spacecraft was sinking, and they determined that the air outside was OK to breathe. They blew open the hatch, abandoned ship, and tossed out an inflatable yellow raft with various survival kits (food and water supplies for 3 days). Taylor noticed the time controls -- it was now November 25, 3978 - 2,006 years later, and shortly later determined they had been away from Earth for only 18 months. As they rowed to the barren land, the spacecraft sank. Taylor hypothesized that they were 320 light-years from Earth on an unnamed planet in orbit around a star in the constellation of Orion, as Landon added: "The question is not so much where we are as when we are." Dodge ran some soil tests with his equipment and Geiger counter, determining that "nothing will grow here," but there was no dangerous ionization. In the arid heat, they hiked through the rock formations of the desert. There was thunder and lightning, but no rain. Also, there was cloud cover at night, and a strange luminosity, but the planet had no moon. Taylor reminded them of his disgust for humanity: "You're 300 light-years from your precious planet. Your loved ones are dead and forgotten for 20 centuries." As they walked along, Taylor told Landon: "I'm a seeker, too, but my dreams aren't like yours. I can't help thinking somewhere in the universe there has to be something better than man." Dodge located a single flowering plant, indicating: "Life," and they soon found more signs of life. A boundary-line of strange 'scarecrows' on clifftops were spotted, as they came upon a lush oasis of rushing waterfalls and a large pool where they went skinny-dipping. They discovered footprints, and then saw their clothes and equipment being stolen. Left naked, they pursued the culprits and found their supplies damaged and their clothes ripped. They followed more closely and saw that the thieves were mute, primitive but harmless humans (vegetarians), who were also gathering food from a cornfield. Suddenly, there was a ferocious roar from the nearby woods, as the primitives responded hurriedly and fled. Hairy-faced gorillas on horseback indiscriminately fired their rifles on the innocent humans as they charged through the cornfield. They used long sticks to beat down the corn, and various snares, traps and nets to catch them in flight. As he ran, Dodge was shot and killed, Taylor was shot in the throat, and Landon was captured but suffered a head wound. All the live captives were strung up by their feet, and the dead ones were piled up, as some of the talking apes took 'victory photos' of their hunt. Taylor was transported in a cage, along with one notable primitive named Nova (Linda Harrison) that had caught his eye. At "Ape City," the injured primitives (called stinking "animals" or creatures with communicable diseases) were treated by two ape scientist-doctors, Dr. Zira (Kim Hunter) and Dr. Galen (Wright King). One of the patients was Taylor (the one with "strange clothes") who had lost a lot of blood. Dr. Zira explained how the "animals" were important for their research work and experimental brain surgeries. Placed in a cage, Taylor was considered a recovering patient (nicknamed "Bright Eyes" by Zira), who now realized that he had been rendered mute. One of the workers noticed: "He keeps pretending he can talk." Zira showed off Taylor to her administrative boss, an orange-colored orangutan named Dr. Zaius (Maurice Evans), the Minister of Science - Taylor struggled to speak but could only mouth words, while Zaius thought it was merely amusing: "A man acting like an ape...He has a definite gift for mimicry." Zaius was disbelieving: "Man has no understanding. He can be taught a few simple tricks, nothing more." He then cautioned Zira about her behavioral studies: "To suggest that we can learn anything about the simian nature from a study of man is sheer nonsense." Humans were only considered a nuisance, who only ravaged the apes' crops: "The sooner he is exterminated, the better. It's a question of simian survival." Nova was caged with Taylor by Dr. Zira so that they could pair up or mate - but she could only sniff at him. When Dr. Zira's fiancee, archaeologist Dr. Cornelius (Roddy McDowall) arrived, Zira showed off "Bright Eyes" to him. Dr. Zaius joined them, as Taylor attempted to communicate with all of them by writing in the dirt "I CAN WRITE" - but Nova wiped away most of his message. When a fight ensued in the cage between Taylor and another human, Taylor was forcibly taken away. Dr. Zaius noticed, however, that part of the word "WRITE" remained in the dirt - proof that Taylor was intelligent, but he scratched out the word with his cane. Ironically, he had just told one of the gorilla guards that it was going to be unlikely for the animal psychologists to prove that they could "domesticate" man. Confined in another cage, Taylor stole paper from Dr. Zira when she came too close, and wrote her a note: "MY NAME IS TAYLOR" -- and she ordered his release to her own home to study him further, although it was against the rules. Dr. Cornelius thought Taylor's writings were only a stunt, and asked: "Where did you learn to do this?" Taylor replied with a note: "Jefferson Public School, Fort Wayne, Indiana." Cornelius thought Taylor was intelligent, but crazy. Taylor couldn't convince them of his origins on Earth, or the possibility of space flight (and astonished them with a paper airplane demonstration). They also didn't believe that he had survived the "Forbidden Zone" after he landed there and trekked through the desert to their jungle area. Cornelius' theory was that "the ape evolved from a lower order of primate - possibly man" - and Taylor could prove his theory, although it was a dangerous (heretical) one. Although Cornelius had discovered traces of a culture "older than recorded time" in the Forbidden Zone during an archaeological dig, his work wasn't supported by the Academy. Zira thought Taylor might be a "mutation, a missing link between the unevolved primate and the ape," although Taylor firmly objected to that idea. Dr. Zira was reprimanded when Dr. Zaius and Dr. Maximus (Woodrow Parfrey), Commissioner for Animal Affairs, discovered the human outside the compound without a leash. She vainly argued it was a "special case" - as Taylor was muzzled and led back to his cage. He overheard that Dr. Zaius had ordered him to be gelded (or castrated) with a surgical procedure, and escaped as he was going to be transported. He ran through the "Ape City," causing cries of shock. He hid next to a memorial service being held to commemorate a fallen gorilla - "hunter, warrior, defender of the faith, cherished husband, beloved father, generous master...a font of simian kindness." He raced through a market, fought off gorilla police, and fled into a museum with living tableaux of humans - and was stunned to see the taxidermied body of Dodge in one of the displays. He was eventually surrounded, cornered, and recaptured in a net - and angrily screamed at them (with his healed throat) with words that shocked them: "Take your stinkin' paws off me, you damn dirty ape!" Now in the custody of the Ministry of Science for weeks, and recaged, he told Nova: "No one will listen to me. Only you." He briefly reenacted the famed Tarzan scene with Nova: "Yeah. Me Tarzan, you Jane." As the gorilla prison officials separated them and sprayed him with a high-powered water hose, he screamed: "It's a madhouse. A madhouse!" He spoke to Nova about how he left Earth because "there was no one to hold me there" - but now he had developed feelings for her. He asked: "Do you love me, I wonder? Can you love, I wonder. You're not as smart as Stewart, but you're the only girl in town." Taylor was brought before an ad-hoc tribunal hearing of the National Academy, presided over by its President (James Whitmore), assisted by Maximus and Zaius, and with Dr. Honorious (James Daly), Deputy Minister of Justice, appearing for the state as its prosecutor. In the kangaroo court, Honorious argued that the human had no rights under ape law, although Dr. Zira countered: "He is unlike any man you have ever seen." Cornelius rephrased the question: "Is he a man, is he a deviate, or a freak of nature?" Dr. Zaius clarified: "It is scientific heresy that is being tried here." Anyone defending "this animal" would be endangering their own career. Taylor (or "Bright Eyes"), the "accused," then volunteered to defend himself, but was forcibly silenced whenever he tried to speak. Honorious reaffirmed the ape's articles of faith, while denouncing evolution: "...the Almighty created the ape in his own image, that he gave him a soul and a mind; that he set him apart from the beasts of the jungle and made him the lord of the planet. These sacred truths are self-evident. The proper study of apes is apes. But certain young cynics have chosen to study man. Yes, perverted scientists who advance an insidious theory called evolution." 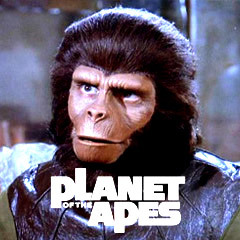 Honorious claimed that Zira and surgeon Galen operated on the ape, and thus tampered with his brain and throat to produce "a speaking monster." Zira rose to defend herself and object: "Not only can this man speak, he can think. He can reason." To demonstrate that the speaking human was simply a hoax, Honorious asked Taylor questions about Ape history and culture that he simply could not answer, such as: "Why are all apes created equal?" Taylor replied: "Some apes, it seems, are more equal than others." Other questions that Taylor didn't answer: "Why do men have no souls?" and "What is the proof that a divine spark exists in the simian brain?" Instead of speaking, Taylor had Cornelius read his written statement, about his arrival from a planet in a different solar system as a space explorer, and that he had two "intelligent companions" with him at the time of his capture. The court produced a group of "creatures" including Landon - which Taylor acknowledged as possessing "kinship" with him, but Landon could not speak for himself - he had been lobotomized and was severely catatonic. Taylor was incensed: "You cut up his brain, you bloody baboon!...You cut out his memory. You took his identity. And that's what you want to do to me." At this point, Cornelius affirmed that there was proof that the human had come from the Forbidden Zone, because he had accurately described it. And there, Cornelius described how he had found evidence a year ago of a simian culture that existed long before the sacred scrolls were written. Zira spoke about Taylor's origin - that if he had actually sprung up from their planet, she had found "no physiological defect to explain why humans are mute...Their speech organs are adequate. The flaw lies not in their anatomy, but in the brain." The three officials at the front of the tribunal assumed the "See No Evil, Hear No Evil, Speak No Evil" pose. Cornelius called the human a marvel -- "this living paradox, this missing link in an evolutionary chain." Zira and Cornelius were charged with contempt of court for their outburst and heretical scientific statements (and threatened with being brought to trial for heresy), and the hearing was adjourned. In private, the noble and arrogant Dr. Zaius commended Taylor for making it possible for the state "to expose Zira and Cornelius." Now in Zaius' custody, Taylor was threatened with emasculation, and then experimental surgery on the speech centers of his brain (a lobotomy), unless reprieved. He asked again: "Tell me who and what you really are and where you came from, and no veterinary shall touch you....Where is your tribe?" Taylor couldn't convince Zaius to believe that he was from another planet, but was relieved that Zaius confessed he didn't think Taylor was a "monster created by Dr. Zira." He actually agreed with the scientists' heretical views about the human's identity: "You're a mutant...I admit that where there's one mutant, there's probably another and another, a whole nest of them." And then Taylor asked the most important question: "Who are you? How in hell did this upside-down civilization get started?" Zaius demanded to know about the possible existence of another human civilization in the jungle beyond the arid, desolate Forbidden Zone, and then called Taylor a problematic "menace, a walking pestilence." Taylor was given six hours to make a "full confession" (or fabricate lies) about his origins. As he was led away to his cage, Taylor screamed: "What are you afraid of, Doctor?" Dr. Zira's young nephew Lucius (Lou Wagner) helped Taylor escape from his cage by knocking out the guard Julius (Buck Kartalian). It was Dr. Zira's idea to abduct him from imprisonment, using the false story that he was being taken to the zoo. Taylor insisted that mute cave-woman Nova be released also to join them ("I want her!"). Cornelius met them for their "expedition," with horses, supplies, and guns, and the two ape-scientists explained how they were also fugitives, indicted for heresy. Taylor took one gun for himself, proclaiming that no one would be in charge of him from then on. They all proceeded to the Forbidden Zone, a 3-day ride across the desert, where Cornelius had performed diggings a year earlier. It was called the Forbidden Zone because the "deadly" area was quarantined - "an ancient taboo set forth in the sacred scrolls." [The scrolls were written 1,200 years earlier.] As they camped on the beach, Taylor shaved his face and told inquisitive Lucius: "In my world when I left it, only kids your age wore beards." Suddenly, Dr. Zaius and armed gorilla-police arrived on horseback and pronounced them under arrest after tracking them down, but Taylor threatened them with his gun and they were ordered to withdraw. Zaius and the group entered a vast cave on the beachfront - "a fabulous treasure of fossils and artifacts" to possibly extend further back than the "sacred scrolls" evidence of another culture. On the lowest level of his diggings, Cornelius displayed remnants (a human doll), ruins and bones from a civilization about 2,000 years ago - a paradox "for the more ancient culture is the more advanced." He added: "No trace of simian fossil has been found in this deposit." Zaius was unconvinced: "Keep digging, Cornelius. You'll find evidence of the master of this house, an ape." Taylor believed that there were humans, although "a weak, fragile animal," before the apes - "he was here before you, and he was better than you are." When the human doll spoke: "Mama, Mama," Taylor asked: "Would an ape make a human doll that talks?" Gunshots from the beach rang out and interrupted their discussion. Taylor held Zaius hostage, and forced him to call a ceasefire and withdraw his apes. He extracted a promise to let him and Nova escape (with a horse and a week's supplies). He affirmed to Zaius that Cornelius' work proved the superiority of humans over apes: "Man was here first. You owe him your science, your culture, whatever civilization you've got." However, the human race presumably didn't survive because of "a plague, some natural catastrophe, a storm of meteors" - and Zaius knew this all along - as "defender of the faith, guardian of the terrible secret." In the 29th scroll, the 6th verse, it was prophetically written by the Lawgiver: "Beware the beast man, for he is the devil's pawn. Alone among God's primates, he kills for sport or lust or greed. Yea, he will murder his brother to possess his brother's land. Let him not breed in great numbers, for he will make a desert of his home and yours. Shun him, drive him back into his jungle lair, for he is the harbinger of death." Before Nova and Taylor left on horseback to follow the shoreline, they said goodbye to Zira and Cornelius (who felt that Taylor had proved their innocence). He told Lucius: "Never trust anybody over 30" and kissed Dr. Zira goodbye! - she agreed but added: "All right, but you're so damned ugly." And Zaius confessed he had always dreaded the coming of the hated human: "I have always known about man. From the evidence, I believe his wisdom must walk hand in hand with his idiocy. His emotions must rule his brain. He must be a warlike creature who gives battle to everything around him - even himself...The Forbidden Zone was once a paradise. Your greed made a desert of it ages ago." On the planet where "apes evolved from men," Taylor asked why: "There's gotta be an answer." Zaius cautioned: "Don't look for it, Taylor. You may not like what you find." As they departed, Zaius ordered explosives detonated to seal up the cave (with evidence of humans and their society), and Zira and Cornelius would both stand trial for heresy, without proof to exonerate them. He told Lucius that he may have just saved the future for all of them. Zaius told Zira that Taylor would soon find "his destiny." This film's iconic, chilling, startling, twist-surprise ending has become common knowledge -- stranded American astronaut George Taylor, having escaped from enslavement and imprisonment by talking civilized apes, rode on horseback down a beach shoreline in the Forbidden Zone with Nova; he suddenly stopped when he saw something, and dismounted to stare upwards; as the camera panned forward toward Taylor, through a spiked object, he exclaimed: "Oh, my God! I'm back, I'm home. All the time, it was..." He dropped to his knees: "We finally really did it." He pounded his fist into the sand and railed against Earth's generations almost 2,000 years earlier that had destroyed his home planet's civilization with a devastating nuclear war: "You maniacs! You blew it up! Ah, damn you! Goddamn you all to hell!" The full object came into view as the camera panned backward - the spiked crown of a battered Statue of Liberty buried waist-deep in beach sand. The first film in the original five-film series. There were also two TV series, one live-action and one animated: CBS-TV's Planet of the Apes (1974), and the animated Return to the Planet of the Apes (1975). Finally, there was a reboot or reimaging of the film, Tim Burton's Planet of the Apes (2001). The latest Apes incarnation was a so-called 'reboot' trilogy, beginning with the origin (or prequel) story Rise of the Planet of the Apes (2011), set in the present, from director Rupert Wyatt. It starred James Franco as a scientist who discovered a formula that increased an ape's IQ. Computer-generated ape faces replaced rubber-latex masks. It was followed by two more films in the trilogy (both from director Matt Reeves): Dawn of the Planet of the Apes (2014) and War for the Planet of the Apes (2017). This first film was the film version of the science-fiction novel by Pierre Boule, with a script by The Twilight Zone's Rod Serling, and ex-blacklisted Michael Wilson. With a production budget of $5.8 million, and box-office gross receipts of $32 million (domestic). With two Academy Awards Oscar nominations: Best Costume Design, and Best Original Score. Also an Honorary Award presented to John Chambers for "outstanding makeup achievement."